Richmond’s VFL side secured its first win of 2016 with a stunning 52-point win over Footscray, on the back of five goals from key-forward Liam McBean. The famous ‘yellow and black’ blasted across Punt Road Oval, as the Tigers staged a scintillating 78-point turnaround with the final scores reading 17.10. (112) to 7.18.(60). While Liam McBean’s five goals were handy, it was his poise under pressure and his willingness to work into space and attack the aerial contests which shone brightest. Tigers’ senior coach Craig McRae beaming after his first win at the helm was delighted with his side’s ability to pressure the Bulldogs, and get the game played on its terms after a shaky start. “I spoke about how proud I was of the effort, but also their ability to play their roles. “We had a lot of guys playing their roles and they got rewarded for it." McRae is hoping that McBean’s performance was just an entree, and highlights what the developing key-forward can achieve when he brings the required intensity and work rate. “Five goals is a good outcome but I still think there’s a lot of upside and improvement to come. “I think it’s important to realise that when Liam (McBean) gets to contests and he tries to impact them instead of waiting for someone to kick the ball to him then he can play. “In recent weeks he hasn’t had the energy; or effort or want to get to those contests, and he still has a lot of work to do." Richmond was buoyed by last week’s performance against Williamstown and controlled the ball between the arcs for the majority of the first term, but let itself down going inside 50. A few costly turnovers resulted in Footscray gaining the ascendency, as the Tigers found themselves 19 points down at quarter time. After a bit of tinkering by the coaching staff at quarter time, the Tigers led by the tenacious Steve Morris, got the game played on their terms, and started to impact the scoreboard. “When we got the ball inside 30, you saw the impact." The Tigers slammed on six-goals-to-one in the second term, and with Ivan Maric exerting his influence at the stoppages, were able to get on-top through the midfield. McBean nailed back-to-back goals and Mabior Chol kicked two of his own, as Richmond piled on the pressure in the second term, and entered halftime leading by a goal. The third term started in tremendous fashion, with McBean nailing two in a short space of time which stretched the lead out to 17 points. Footscray kicked back-to-back goals mid-way through the third, which slashed the deficit to five points before Jake Batchelor got the better of Jack Redpath and Nick Mellington made the Bulldogs pay. 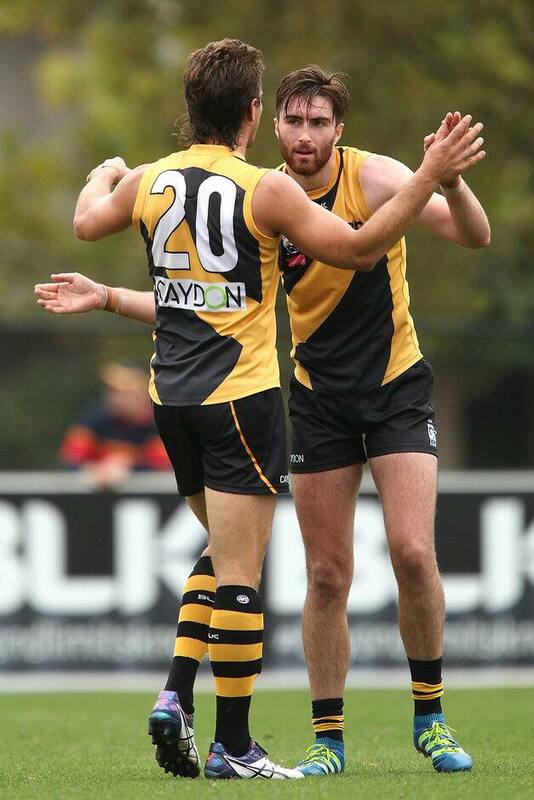 Richmond skipper Sam Darley led from the front all-day, while his two goal saving efforts late in the third term assured the Tigers took an 11 point lead into the final change. The final term was one to savour, as the Tigers went on a seven goal blitz to seal a memorable win, of which McRae hopes instills belief and propels his side through 2016. “We’re a team that’s just trying to find itself and there’s no end-point so they just kept pushing; and pushing and pushing, and I was really proud of that,” McRae said. “Last week we didn’t quite get over the line and I thought we took a step forward today." Richmond was led in the last by flint-hard midfielder Anthony Miles, in a performance that could see him shoot straight back into the AFL contention. “‘Milsey’, started a bit slowly and then he really worked into the game and he had plenty of the footy and at our inside contests I thought he was outstanding,” McRae said. Miles had a team-high 30 disposals, while bullocking midfielder Tom Couch (27 disposals) and Sam Darley (25 disposals) were stand-outs. McBean kicked a game-high five goals; with Dan Butler, Mabior Chol, and Nick Mellington bagging two each. Richmond has evened up the ledger at 1–1 and next week travel to Frankston Oval to take on the Dolphins at 2pm on Saturday April 23.